Business & Commercial Aviation’s history is embedded in the industry it serves. Business & Commercial Aviation published since 1958, has been the premier source of analysis providing unique and award-winning editorial to the business aviation market place, making it the number one publication among the world’s most influential business aviation decision-makers. BCA is the leading source of “how-to” operational and management information for the business commercial aviation marketplace. With its unrivaled editorial, BCA is the #1 source delivering key information to assist aviation professionals and owners and operators in business and corporate flight departments worldwide to keep flying with optimum safety and cost effectiveness. Business & Commercial Aviation provides you its annual Purchase Planning Handbook — recognized for more than 58 years as the aviation industry’s most authoritative source of unbiased, detailed, comparative data on business aircraft and equipment. It is the primary source that business aircraft decision-makers consult before making any equipment purchases. 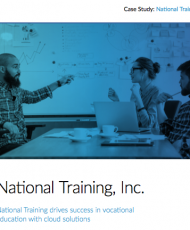 Case Study: National Training, Inc.